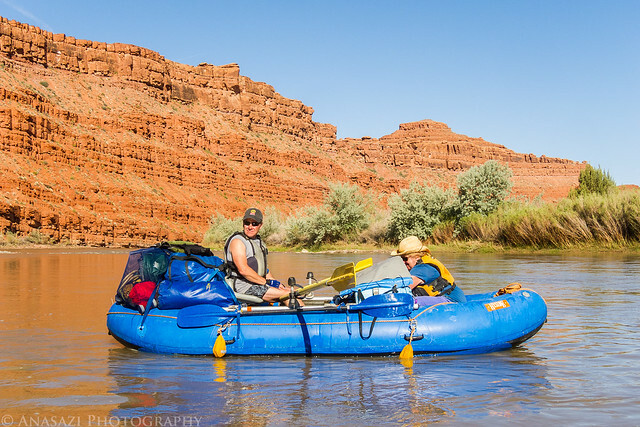 I have wanted to get on the San Juan River for a while, but because of the permit system in place I have never really tried. This year I decided it was finally time to try and secure a permit for myself and a few friends from work. Unfortunately, we didn’t manage to get any permits from the original lottery. However, I was able to grab an opening at a later date. 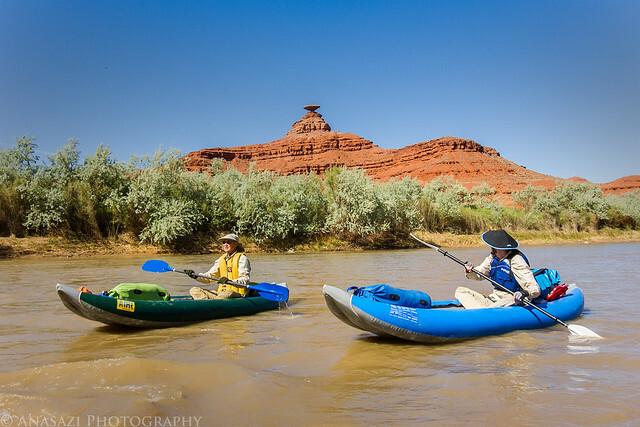 We had originally wanted to try and do the whole stretch of the San Juan from Sand Island to the Clay Hills Crossing, but the permit we were able to get only let us go to Mexican Hat on this trip. After work on Tuesday I drove down to Sand Island near Bluff and grabbed the last available campsite since I didn’t want to have to drive down the following morning. That night it stormed on and off and the wind was blowing pretty good. It made me a little worried about how the weather would be for our trip down the river the next few days. Loading our boats at the Sand Island launch as dark storm clouds roll in. 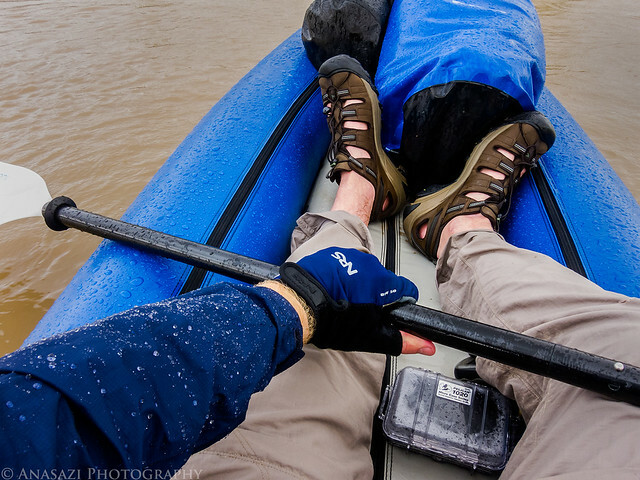 Shortly after launching the skies opened up and rain and hail began to fall. By the time I got my rain jacket on I was already soaked and cold. The jacket helped warm me up a bit. Steve and Pirie had the only large raft in our group. The ‘Tiger Wall’ behind us. Eventually the storm clouds started to clear and we saw some blue sky. The temperature started to warm up a little, too. 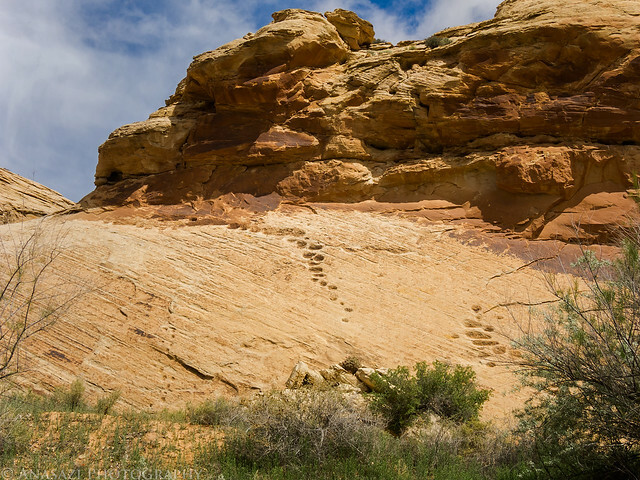 We passed these Moki Steps carved into the sandstone cliff along the river. 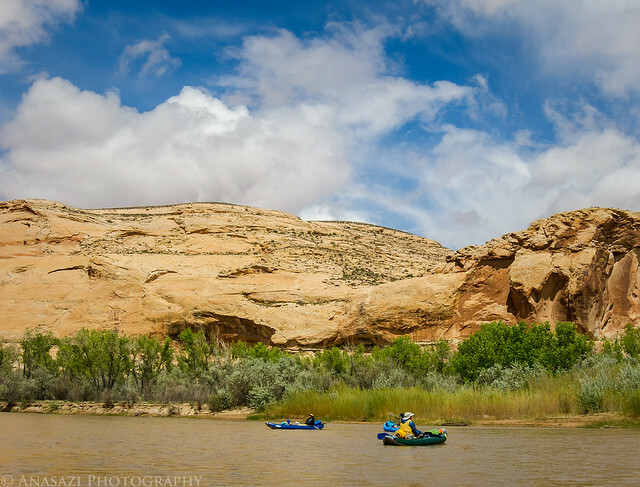 Our first stop of the day was at the mouth of Butler Wash so that we could visit some of the petroglyphs found here. 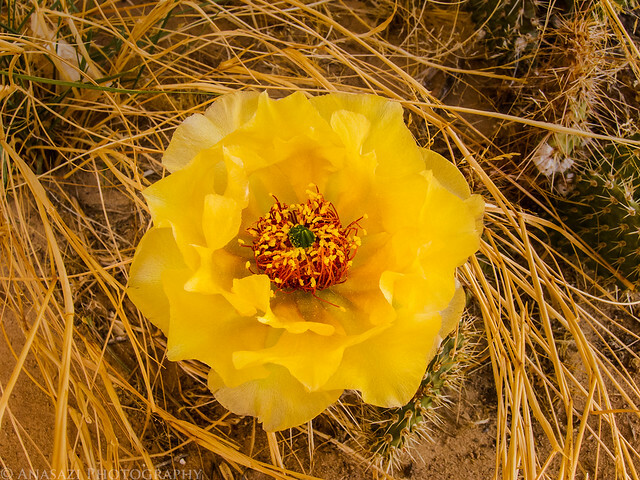 The cacti were in full bloom as we hiked up Butler Wash.
Jackson and his son hike up to the petroglyphs along the river. A few of the many petroglyphs found here. I didn’t take many photos since I hiked down to these petroglyphs back in May of 2011. 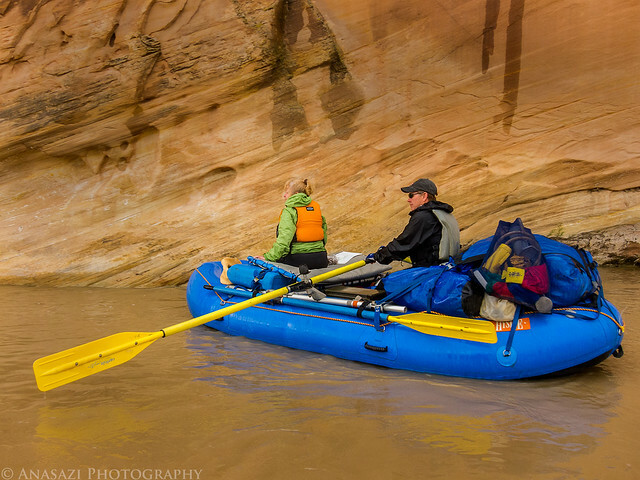 Floating past a large alcove in the sandstone high above. 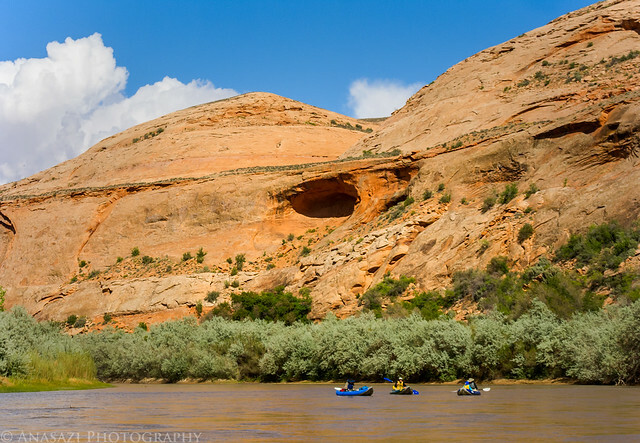 Our next stop along the way was on the Navajo Nation side of the river so that we could search for the Desecration Panel, which was one of my main objectives to find on this trip. I had an idea where these petroglyphs might be, but didn’t know for sure. Luckily my guess was right and we had no problem finding them. 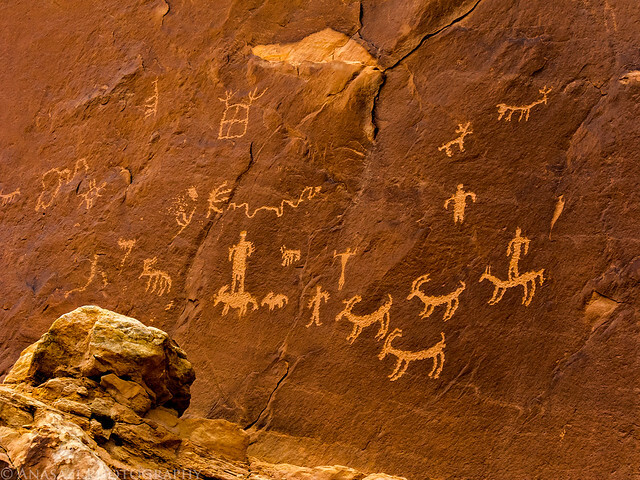 In the 1960’s a number of Navajos who lived near this rock art site mysteriously fell ill. Upon seeking the help of a local Medicine Man, they were told that the source of their illnesses came from this rock art panel along the San Juan River. The medicine man said that ‘altering’ the rock art images, if done with the proper knowledge and ceremonial approach, would put an end to their suffering. This alteration would stop the malevolent power coming from the images on the rock and return the world to a state of balance and beauty. The result is what we see today on the Desecration Panel. There were a lot of petroglyphs found in this area including this busy panel. 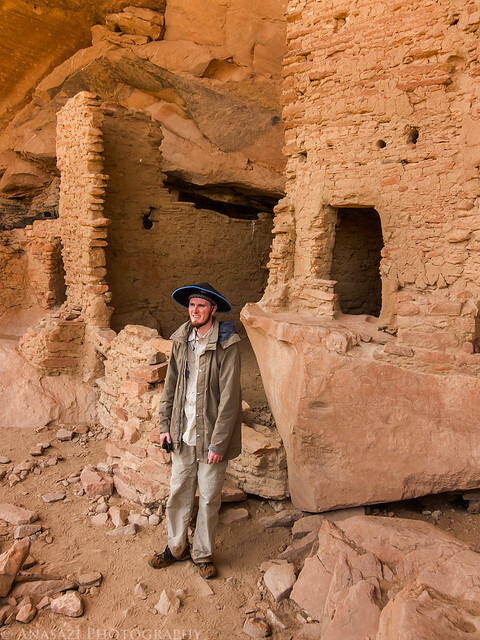 Shortly after leaving the Desecration Panel we soon found ourselves exploring the nearby River House Ruins, also known as the Snake House Ruins. I didn’t take many photos here either since I’ve visited these ruins a number of times before. A little further down the river we made our final stop of the day at our first campsite of the trip. 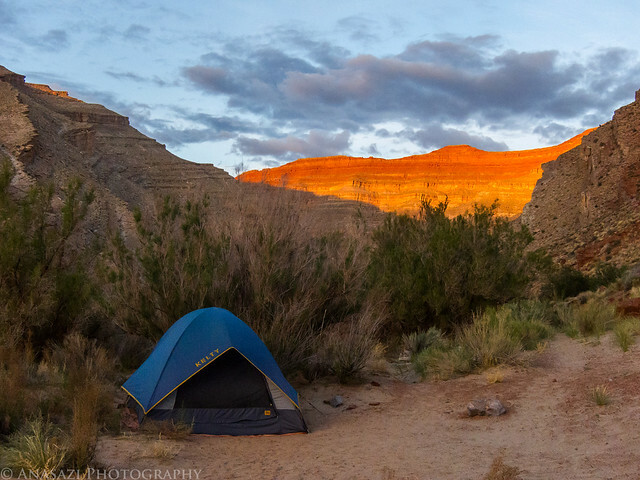 We had hoped to camp at Chinle Wash so we could hike from there in the morning, but that site was occupied, so we ended up across the river at the Big Stick camp. 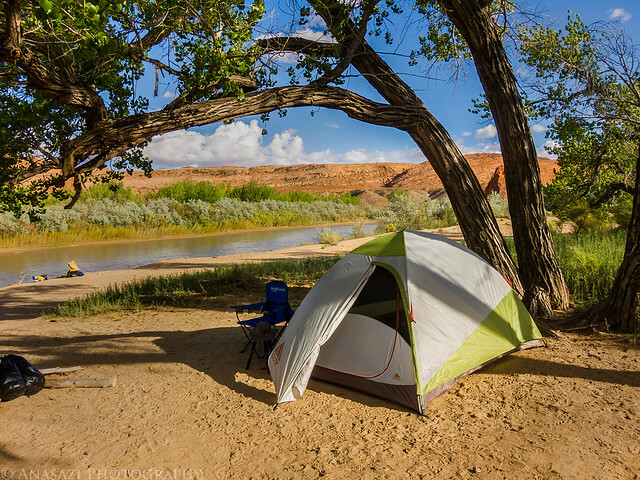 It turned out to be a really nice place to camp. 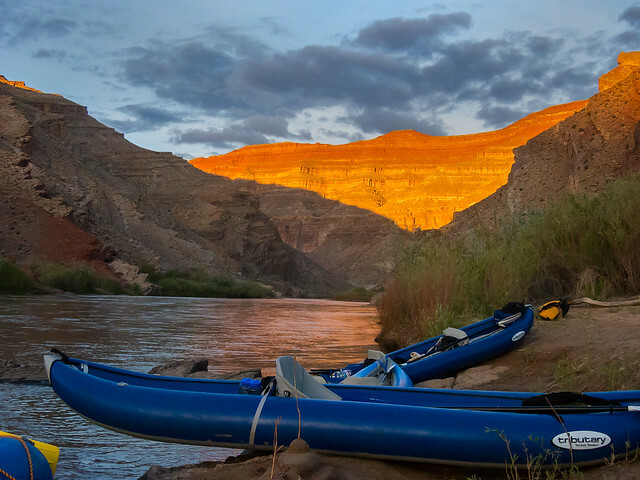 Sunset over our boats and the San Juan River from the Big Stick Camp. 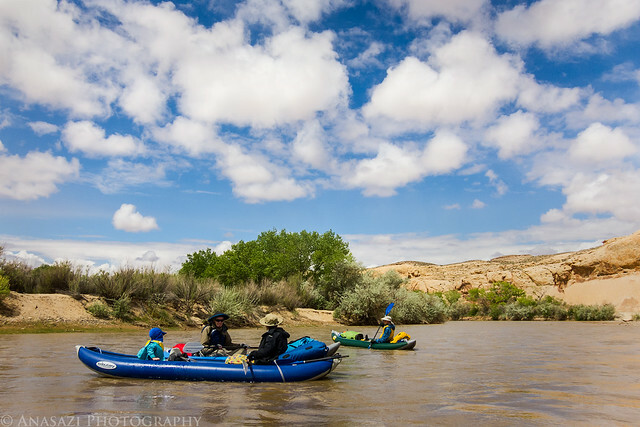 The following morning we had some breakfast, broke down camp, loaded up our boats and continued on down the river a short way just past the confluence with Chinle Wash on the Navajo side of the river. 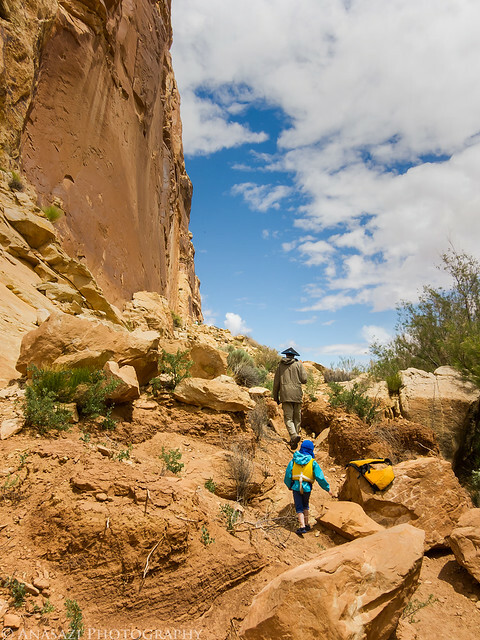 We then started our hike up Chinle Wash, which was my second main objective on this trip. We found a few ruins up on a ledge above the wash.
Then I spotted the well-known Baseball Man pictograph that I was looking for. We also found this cool petroglyph panel on the other side of the creek. Jackson next to the petroglyphs for scale. 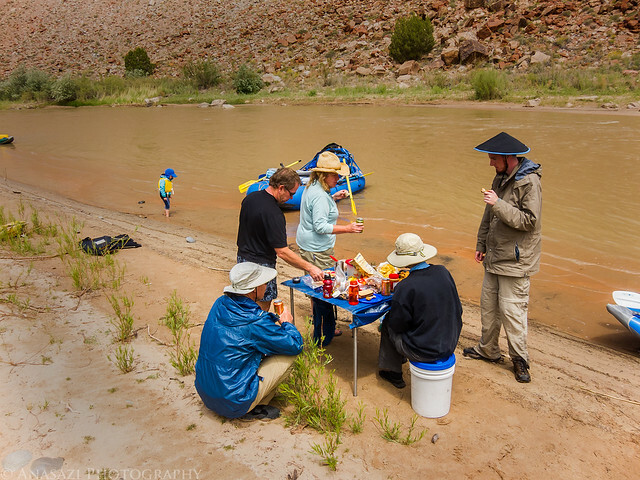 After leaving Chinle Wash, we continued down the river without any stops, except for lunch. The weather looks pretty nice here where we stopped for lunch, but it would rapidly change when we got back on the river. 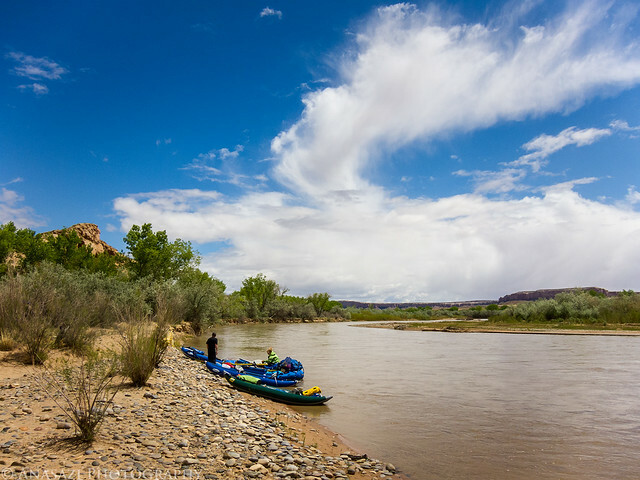 After lunch we were back on the river, but some clouds had moved in and really cooled things off. 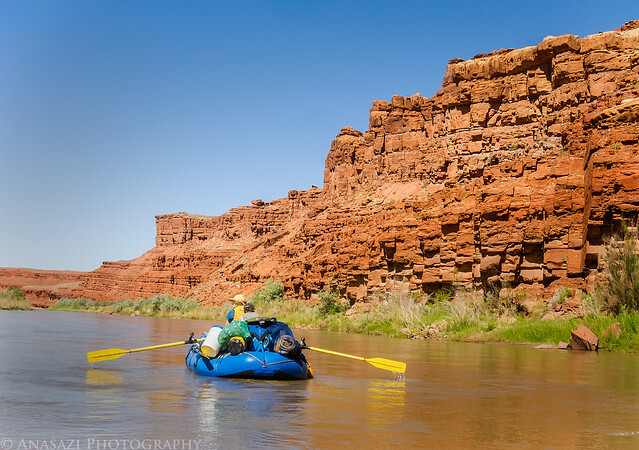 Not to mention we had some pretty serious headwinds that we needed to paddle through that really tired us out. This was also the stretch of river where we went through a few rapids. They would have been pretty fun, except for the fact that we got soaked while it was cold and windy out. Since I spent most of my time paddling through the wind at this time, I didn’t take many photos of this section. 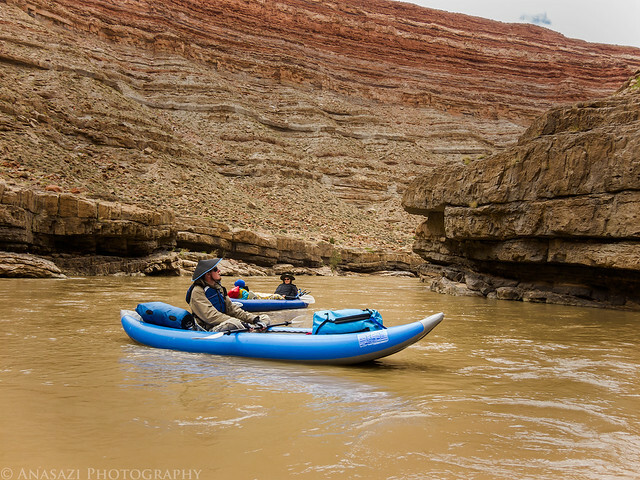 Steve and Pirie float through The Narrows. 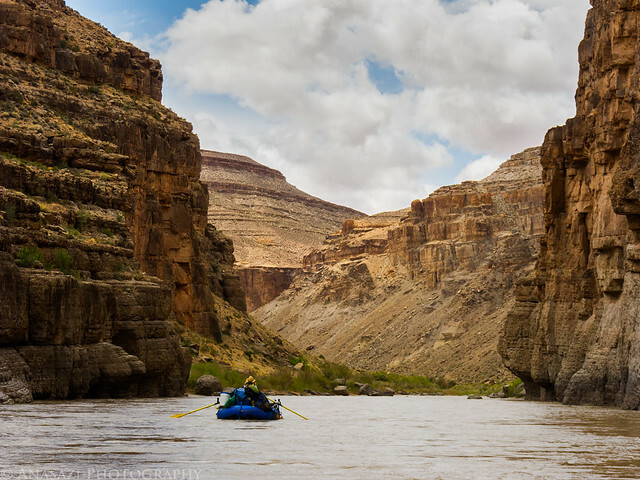 After making it through Ledge Rapid we started looking for a campsite for the night. 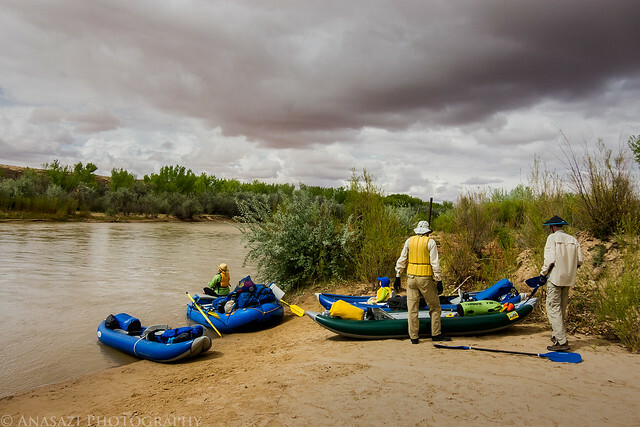 At this point we were all pretty tired of the cold wind and were ready to get off the river. It figures that once we stopped for the day the sky cleared up, the sun came out and things warmed up again. At least we would have a nice evening in camp! 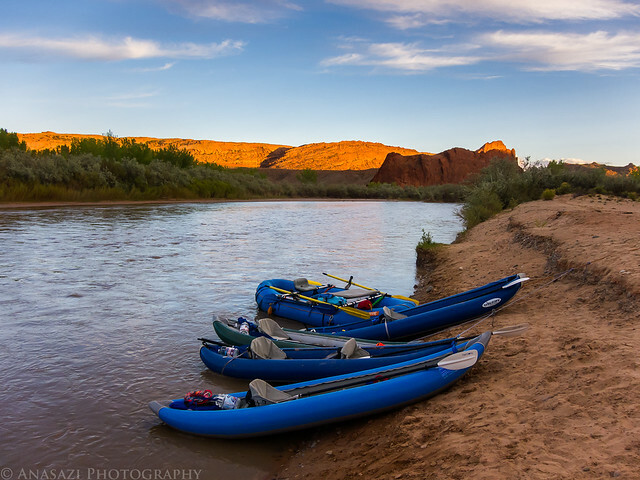 Sunset over our boats and the San Juan from our second campsite. 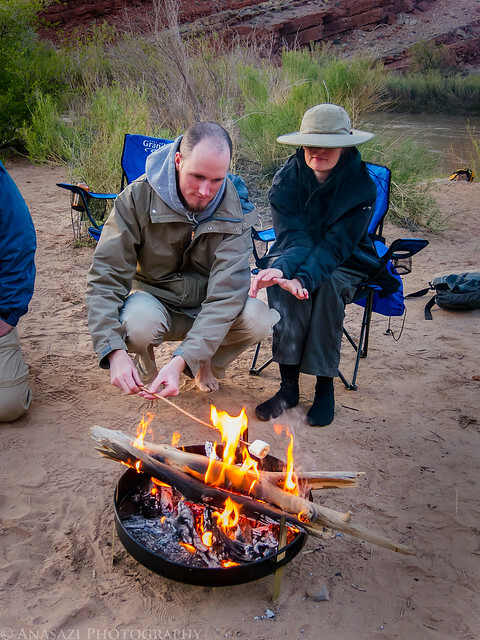 The only campfire we would have on the trip. We needed to warm up after the cold afternoon we had. 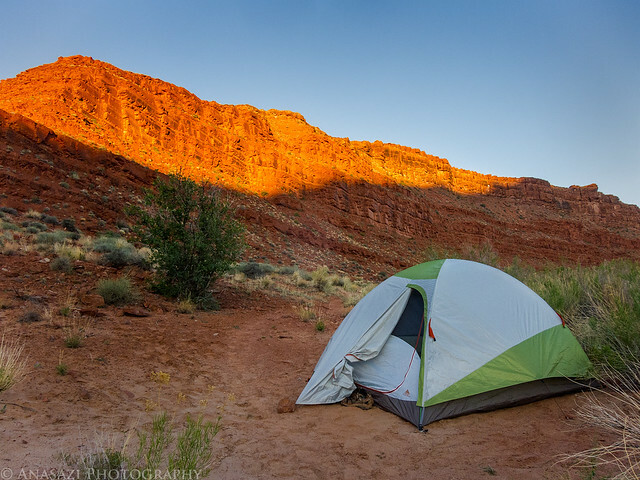 Early morning sunlight strikes the red cliffs above my tent on our final day of the trip. After breakfast our group was back on the river again. This was the first time we had clear skies and lots of sun on the trip. It would stay this way all the way to Mexican Hat. Under Mexican Hat Rock near the end of our trip. The final stretch of river. 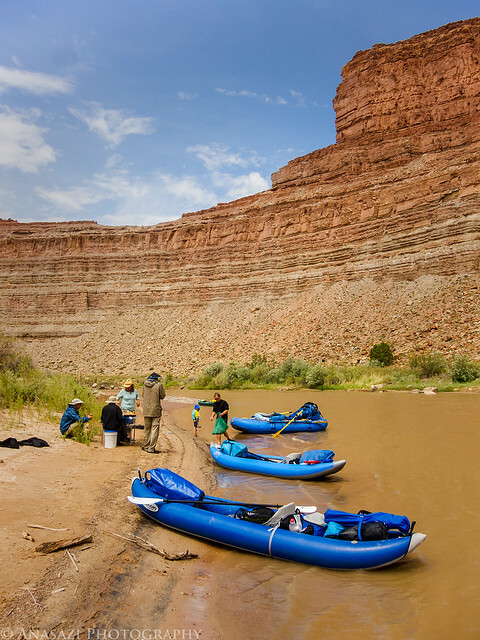 Our takeout at Mexican Hat is just around the next bend. 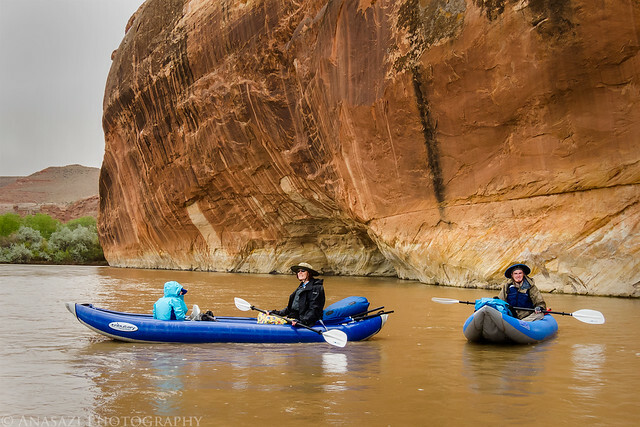 The weather was all over the place on this trip but we all managed to have a great time. 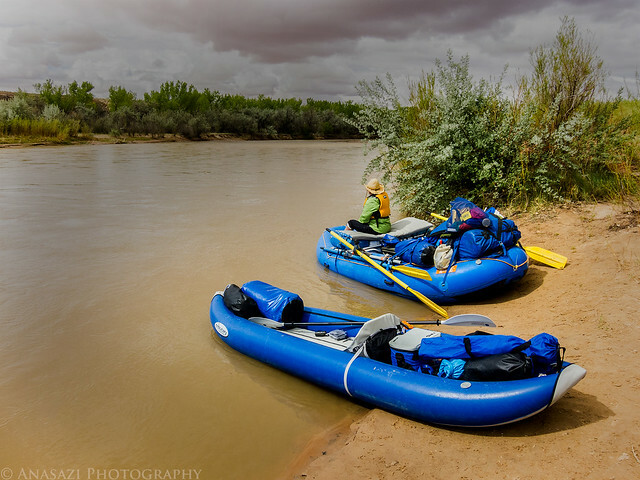 Now I’m looking forward to a longer trip on the San Juan in the future. Nice photos. We just finished our trip there this week. The water was very high. I’m actually getting back on the San Juan this Sunday for a few days. It’s going to be hot!